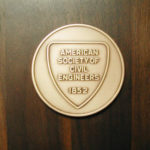 ASCE has honored Tony L. Wahl, P.E., M.ASCE, with the 2019 Hydraulic Structures Medal for his numerous achievements and contributions to the hydraulic structures engineering profession in the areas of dam and channel embankment breach, irrigation systems, flow measurement, and software development, all throughout a distinguished engineering career. Wahl has received previous recognitions demonstrating sustained performance excellence both as a reclamation employee and as a professional volunteer. Having attained his P.E. license in 1994, he was presented the ASCE Zone III Young Government Civil Engineer of the Year in 1995 and subsequently earned a top 10 designation as Federal Engineer of the Year. Other indicators of his dedication include the 2009 Best Discussion Award in ASCE’s Journal of Irrigation and Drainage Engineering and the 2011 Outstanding Reviewer for the ASCE Journal of Hydraulic Engineering. His selection as the recipient of the 2019 Hydraulic Structures Medal is the ideal capstone to a brilliant career in hydraulic structures research and field applications. The Hydraulic Structures Medal is awarded to an individual or individuals for significant contributions to the advancement of the art and science of hydraulic engineering as applied to hydraulic structures.